Bike has been run on Synthetic Motul 7100 V Twin Oil (standard Harley oil in the gearbox) since I have owned it (last changed prior to current off-season storage period). It is fitted with Continental Sport Attack 3 tyres, with plenty of life left on them. It has always been a fair-weather bike for me and I guess any previous owners, judging from the overall condition. All original equipment will come with the bike (belt guards, exhaust etc.) and I have a spare, new in the box, final drive belt. Comes with some service history (original manual/service book, receipts from Maz and photo record of any servicing that I have done). If anyone is interested I'll dig it out from it's winter hibernation and take some more photos. Bike is in Preston, Lancashire. I would clearly love this bike to go to another Buell enthusiast if possible BUT if I look to 'part-ex' it to an independent dealer has anyone a view about the likely value? It's a shame you haven't had more response because it looks like a stunning example. You would certainly do better to hang fire until Spring or Summer. Most dealers these days tend not to use a trade guide but research what similar bikes are advertised for online. They will then base their sale price on what they think it will sell for and work back from there to allow for their preparation costs, profit margin and potential warranty costs. This could go in your favour at the moment because there are three currently advertised by dealers on eBay and Auto Trader which don't look as nice as yours for between £3795 and £3995. 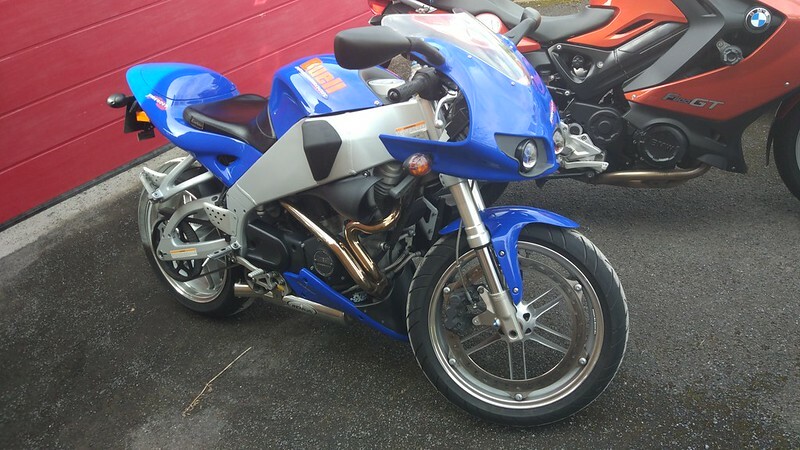 A positive minded salesman who got on with you, was keen to sell the bike you were interested in and liked your Firebolt might persuade his boss that he could sell it for £3995 and allow you £3000. His wily old boss is more likely to tell him that those bikes have been advertised for months and haven't sold so yours will sell at £3495 and is worth £2500 in part exchange. Of course the other important factor with a part exchange is what you are buying. Is it something in big demand with a queue of customers at the door or something that has been sat on the floor for ages that they have a bit of margin that they're prepared to give away to have something different on the floor? Cost to change is the critical factor here so don't get too hung up on the value of your bike and maybe negotiate for a cash discount to see how flexible they are before introducing your part exchange into the frame. Thanks for your knowledgeable view, which kind of aligns with what I was thinking would be the case (i.e. they'd be looking at £1K profit and therefore £1K off the likely selling price). I would much rather sell on, what I think is a nice example, privately if possible but with garage space (adn cash float) already at a premium and Mdm, rightly, emforcing a 'one in one' out policy I need to get rid of the 'bolt before I get something old I have wanted for a while and it looks like there is a nice example available. I might give my local Bike shop a shout in case they are able to offer me a cash deal - they've done that on a couple of my bikes in the past so it may be an option. Seems like they want rid of the bike I am looking at or it is overpriced (which it probably is) as they offered me £3500.......hmmmmmmm. Not a lot of Buells for sale at the moment, not many tidy ones anyway. Looking forward to seeing what's switching spots in the stable!! Don't overthink it Jez. If you're happy with the offer take it before they change their mind. Going to do a little more research on the target (early Eighties Katana) first and pricing. Plus the bike is at the other end of the country. Yeah that one is at the VERY expensive end of an expensive spectrum, at least that is the advice from the Katana forum.